(0 Customer Reviews) | Write Review 6 issues per year Jon Fauer’s Film and Digital Times published on paper, online and on iPad roughly every two months. Depending on events, introductions and technological breakthroughs, we sometimes combine issues into larger editions. Join us for the adventure and subscribe online. We talk about products and procedures in practical production—here’s the job at hand: how do we use tools and techniques to get the results we want? Film and Digital Times is an inside-the-industry look at the nuts and bolts of high-end production: how-to and how not to, technique and technology, style and strategies, tips and trends for Cinematographers, Directors, Producers, Rental Houses, Manufacturers, Camera Assistants, Camera Operators, Photographers, Videographers, Gaffers, Grips, Students, and Faculty. Jon Fauer, ASC is an award-winning cinematographer and director who has written 12 bestselling books, famous for their user-friendly way of explaining things as if you’re right there on location with him. Special Report printed only at Photokina 2014. 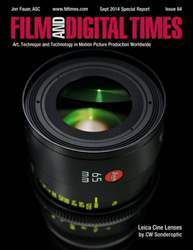 Revised and updated through September 2014: all about Leica, CW Sonderoptic Leica Cine Lenses, Summilux-C, Summicron-C, Still Moving Pictures (stills shot by cinematographers with Leica cameras), Oskar Barnack’s motion picture camera, history, tour of the factory, and a look at the new Leica Headquarters in Wetzlar. 96 pages. Jon Fauer’s Film and Digital Times published on paper, online and on iPad roughly every two months. Depending on events, introductions and technological breakthroughs, we sometimes combine issues into larger editions. Join us for the adventure and subscribe online. We talk about products and procedures in practical production—here’s the job at hand: how do we use tools and techniques to get the results we want? Over 120,000 of his books on cameras, cinematography, film and digital video have been printed. Think of this bimonthly Journal as Fauer’s next book — arriving a year early, with up-to-the minute information brought to you in episodic format. You'll receive 6 issues during a 1 year Film and Digital Times magazine subscription. You'll receive 6 issues during a 1 year Film and Digital Times magazine print subscription.